Bill Ward is a bonafide heavy metal legend. His pioneering work behind the kit with Black Sabbath helped invent the genre, and his hard-hitting, jazz-influenced beats played a big part in Sabbath becoming metal’s first behemoth. Ward, who endured a very public split with Sabbath ahead of their farewell album and tour, has kept himself busy in recent months. During a rare slice of downtime, Bill chatted with us and took on the task of answering our must-know questions. Here’s what he had to say. What was the first kit that you ever owned? “It was a Premier. It was a mahogany kit with 20” bass drum and a four-inch wood-shell snare. I had a concert tom which was really tiny, maybe 9”x8”. We couldn’t afford the floor tom so I just had the bass drum, snare and one tom. It was great, I did a lot of work with that kit. “I was self taught. I didn’t take any lessons. But I’ll tell you what, I was around a lot of drummers. Even when I was still at school we would go to the pubs and clubs in Birmingham and I would watch all of the drummers. I’d see Jim Capaldi with Deep Feeling and I would sit on the stage right next to Jim and watch him. 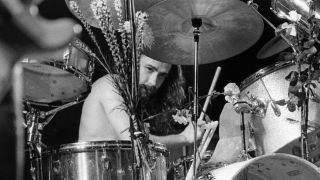 "When Clive Bunker was playing with Jethro Tull I would snuggle in right there by the side of the stage and watch Clive. There were so many guys back then to watch and I watched everybody. Micky Evans was one of the biggest influences on me. He had a drum shop in Birmingham and I would watch him. I would see him every day for years. 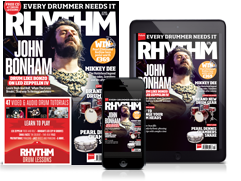 “There was a community around the drummers of the West Midlands. We would all congregate around Micky Evans’s shop. There would be maybe seven or eight drummers sat in there and we would all play a little bit and show each other what we had learned. It was like a drum workshop. “I based my tuning on Gene Krupa, Buddy and Joe Morello. I knew how I wanted the drums to sound and we did the best we could with a beat up Ludwig kit. I spent a lot of time around drummers learning how to get sound. I knew the sound I was after and what would work for what we were playing. "My floor toms were particularly important in the way that I tuned them because we were already going to things like the song ‘Black Sabbath’ so I needed power in my toms. I needed that for my build-ups and for songs like ‘Fairies Wear Boots’. I tuned to maintain the integrity of the sound but at the same time to give the kit some wallop. “Without the jazz influence, the Black Sabbath drumming would be very different. The feels and jazz feels and rock feels were exactly, to me, what we needed in the song. Tony [Iommi] also has a jazz influence. We were playing swing. ‘Fairies Wear Boot’ is like a blues swing. The song Black Sabbath actually has no specific time...If you go looking for the one on the song you’re gonna be f***ed! “As a child the dream was to be like Elvis and have a hit record. I thought if I did that all of my problems would be over. Of course that wasn’t the truth at all. But when our first record went into the charts, I think it was at number 27 and it was the song ‘Black Sabbath’. What is the key to longevity as a musician? "Nowadays I have to be awake at least two hours before a show, I have to do all kinds of things. Back then it was 20 minutes and I would watch everybody get off their chairs. All we wanted to do was go to sleep for a few days and to see the tenacity of the band and regardless of injuries we would get on stage and as soon as we were up there it was like, ‘Bam!’ You were hit with an incredible force.